A rare opportunity to buy a charming, large cottage in the coveted Madison Heights neighborhood. 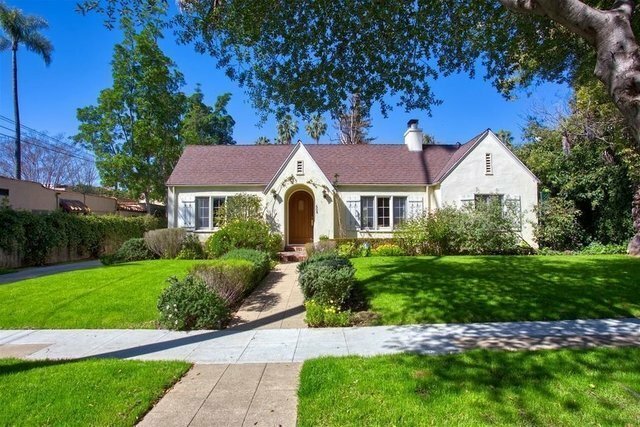 This welcoming English-style home, built during the Arts and Crafts era, is close to South Lake Avenues stores, restaurants, coffee shops, and services, yet affords the privacy of a quiet, friendly, tree-lined street. The world-famous Caltech is nearby, and the Jet Propulsion Laboratory lies within easy driving distance.The light-filled sitting room has French doors which bring the outside inside, extending the living space. The doors open onto a covered patio, a space for entertaining, a handsome fountain and a secluded, landscaped yard. The sitting room has a Batchhelder-tiled gas fireplace, built-in arched cabinetry, and recessed lighting. The formal dining room is enhanced by extensive, dark-wood bookshelves. The kitchen has a banquette for casual dining, and the main bedroom benefits from built-in closets, French doors leading to the rear yard, and an office area. There is a laundry room with ample storage. This delightful three-bedroom, two-bathroom home has hardwood floors. A large, single garage, skyport and driveway can together cater for several cars. Residents all-day street parking permits are also available for the immediate vicinity.